The starter kit of Raspberry Pi 3 B+ helps you start programming very quickly by providing all the important parts. 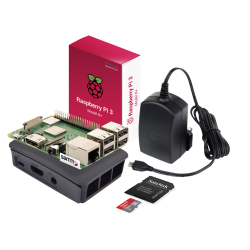 Raspberry Pi 3 B+ starter kit has a Raspberry Pi 3 B+, official case, power adapter and a preloaded Micro SD card. The new Raspberry Pi 3 B+ is the most powerful edition of Raspberry Pi. 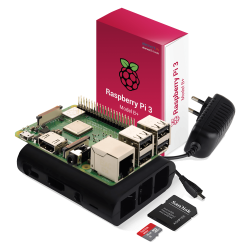 Raspberry Pi 3 B+ has a faster 1.4GHz Quad Core CPU, dual-band Wi-Fi (2.4GHz + 5GHz), faster and more secure Bluetooth 4.2/BLE and three times faster 300Mbps Gigabit Ethernet with Power over Ethernet capability using a separate PoE HAT. Subcribe now to get updates on promotions and coupons. Be the first to get updates on promotions and coupons! Address: SAMM TEKNOLOJİ İLETİŞİM SAN. VE TİC. A.Ş.